This section is for honest critique of the work shown here. Members are encouraged to give and accept non-confrontational constructive criticism as well as adoring praise and everything in between. In order to show case everyone's work equally, please post multiple customs on the same day into a single thread. If you have a lot of pictures of your work you may have to add them to a separate post within that thread. Please do not link to a sale thread or to eBay from your critique thread. This section isn't to be used to market your finished work. The Market Place section is better suited for that purpose. I was researching pulp characters from the 1920/30/40s looking for unique and distinctive characters to turn into customs. I came across Thibaut Corday of the French Foreign Legion. He appeared 21 times in Argosy Magazine in the 1930s in stories by noted pulp writer Theodore Roscoe. 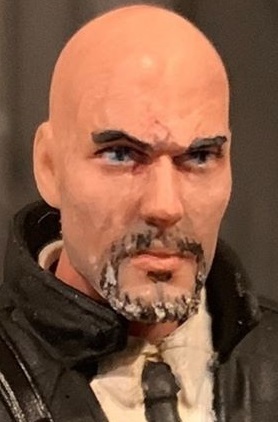 I bought an omnibus edition of the first five tales and set out to make a figure immediately. 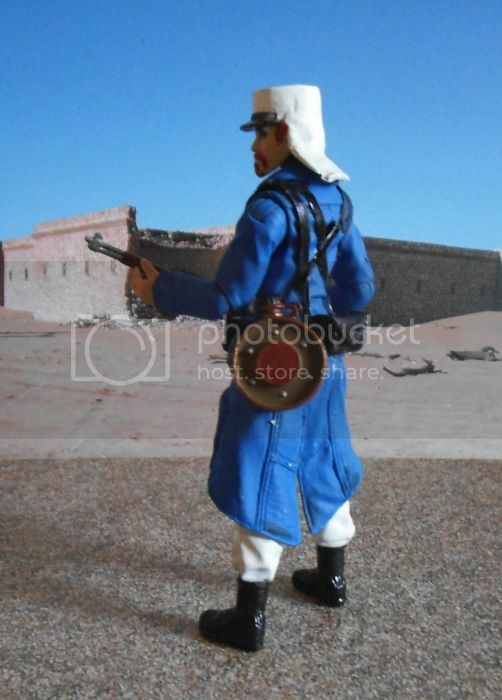 Not easy to find pictures of the uniform from this period, so I got out my Action Man books and used the pictures of the Foreign Legion outfit as my visual reference. 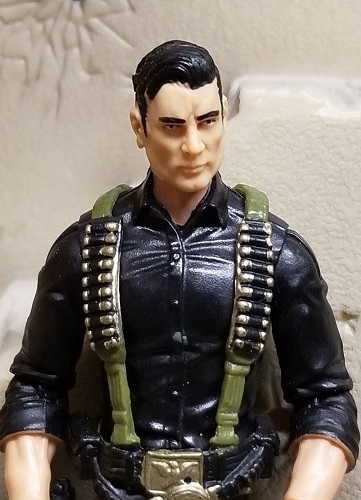 So this custom now fills three niches in my collection: Action Man, Military and Pulp Characters. This figure went through several running changes as I made him. I was originally going to sculpt the hat from scratch, but then I found a spare Raiders German soldier head with cap peak that was the perfect size for the kepi and sculpted white milliput over the top. The bottom of the coat was more of a problem. 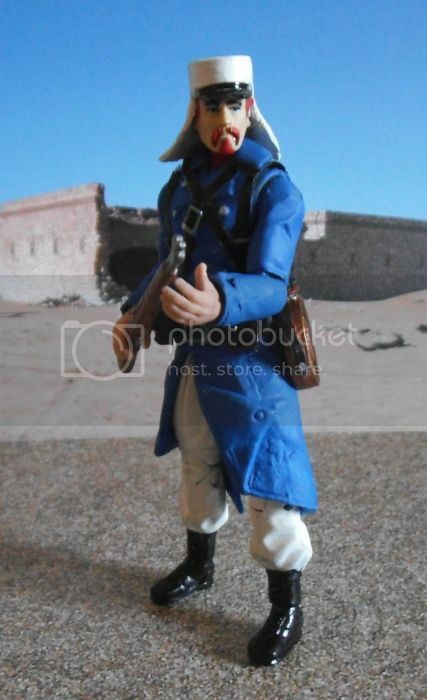 In the end, I pulled apart a RoC Storm Shadow figure and used the coat from that. The sash around the middle covers a multitude of sins. I could not find a Lebel rifle in 1:18, so I went with a BBi rifle I got with some accessories. 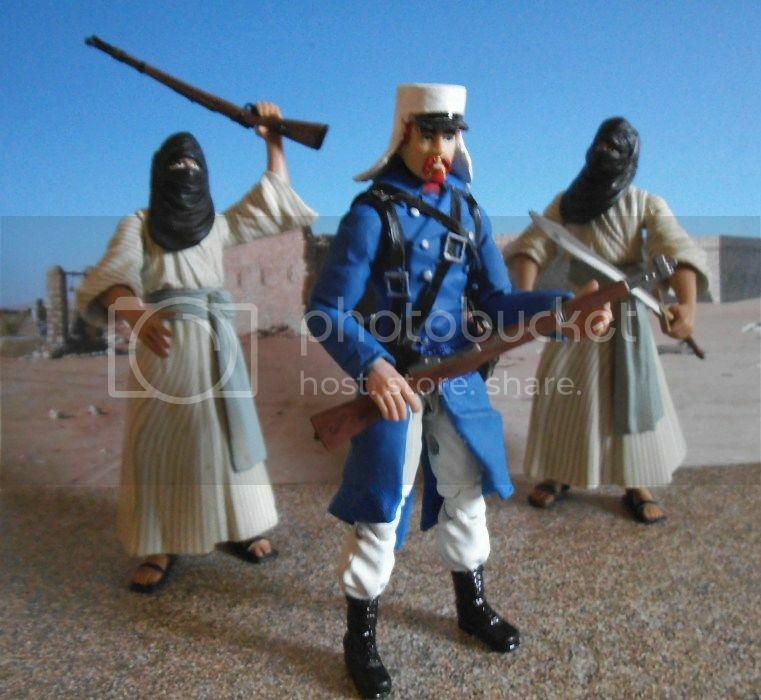 Posing him with the Cairo thugs from Raiders was a no-brainer. You're never to old to have your Botty used as a Bongo. I dig it! Pulp Characters are always under appriciated! That is just fantastic work. Really impressed by the hat. Trade me stuff I need for stuff I've got or buy my customs on eBay. Spin's Weapons Warehouse and Body Shoppe got a Holiday restock! Makes me wish I'd stocked up on Renegades CCs when they were cluttering the pegs on clearance. Once I sculpted the basic shape of the hat, it just took a bit of sanding to get teh correct shape and flatten out the top. I finished painting the figure before I sculpted the 'cloth' at the back of it using milliput. I deliberately raide it off the collar before it set so that I could keep articulation in the neck. According to my research, thanks to your wins this year, you have now won more JCAs than anyone in the history of the award. 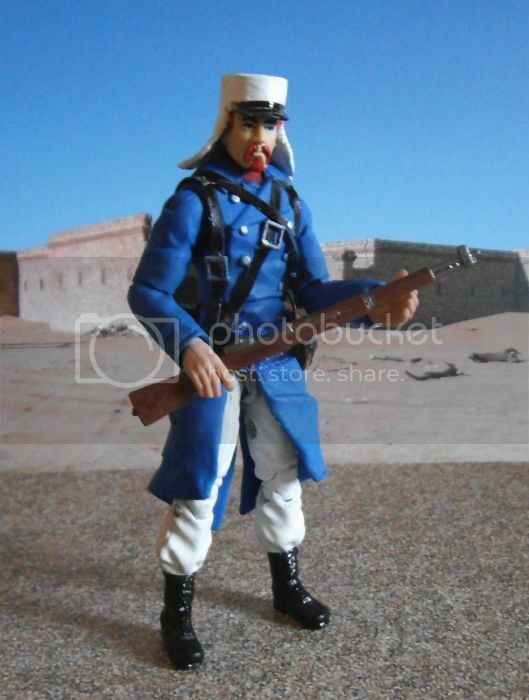 You did well on the hat, one of the more specific details of the French Foreign Legion. I like the classic look.